Blake Lively posts beautiful Instagram message about why she joined the Women's March. Blake Lively was amongst the estimated 400,000+ people who participated in the Women's March in New York City on Saturday. Lively, pictured above with (very pregnant) Sisterhood of the Traveling Pants costar Amber Tamblyn, was just one of the many stars who took to the streets to march in solidarity for women's rights. 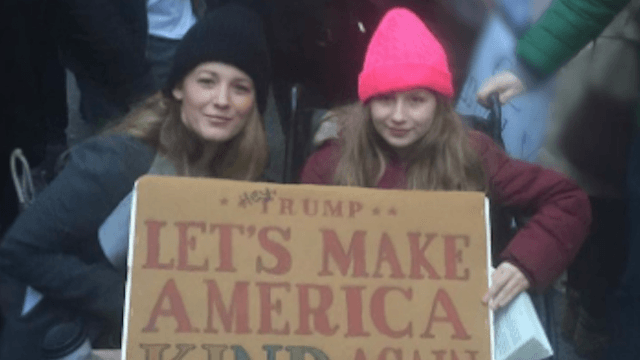 Blake Lively uploaded this picture with a fellow marcher named Phoebe, who uses a wheelchair, to explain why she felt it was important to participate in the peaceful protest. Celebrities popped up at many of the 600+ Women's Marches worldwide on Saturday, include Emma Watson, Chrissy Teigen, Amy Schumer, Madonna, Janelle Monáe, Whoopi Goldberg, Scarlett Johansson, Alicia Keys, Jake Gyllenhaal, Miley Cyris, Katy Perry, John Legend, Nick Offerman, Cher, Ian McKellen, Lin-Manuel Miranda, and Gillian Anderson, to name a few.